Sporting what might be the most unusual name of any movie this year, this Kevin Spacey starrer is based on a book by Gene Brewer, and it explores life in a mental hospital whose newest patient claims to be from the planet K-Pax. The story then drifts into how this patient is affecting the other patients in the hospital and how the cynical doctor begins to second guess his diagnosis. Because of the famillioniar-sounding setting, this movie's box office chances really hinge on its star appeal. And we don't have to go far for the last Spacey-lead drama released in October; Pay It Forward opened in October of 2000 to an opening weekend box office take of $9.63 million and this movie's ambitions don't seem to reach beyond that. 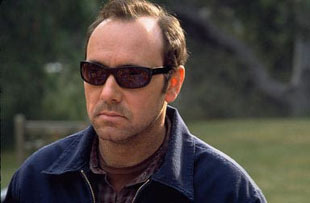 Spacey's biggest non-animated opening was A Time to Kill and he certainly was not the main draw in that film. The bottom line with Spacey is that while he is well respected by Hollywood and moviegoers, he just is not a draw. Most of his movies are a little left of normal and while he usually tends to churn out quality performances in decent to excellent films, he still can't get people to show up opening weekend. This is yet another example of the star not being bigger than the film.